Two Ukrainian servicemen were killed in action yesterday and 13 more, including a servicewoman, were wounded. Sixty-nine ceasefire violations were recorded, 21 of these involved banned weapons. Situation in Donetsk sector remains especially difficult at Svitlodarsk area, with epicenter in Luhanske. “Russia-backed militants were shelling this area non-stop yesterday,” reported the Ukraines Ministry of Defense spokesman on ATO Colonel Andriy Lysenko at a press briefing at Ukraine Crisis Media Center. The most intense attacks took place after the midnight and early in the morning. Russia-backed fired about 40 artillery rounds and the same number of mortar shells during the night. In the morning militants shot ATO troops with over 80 shells within 2.5 hours. They actively used light weapons in this area during the day, including sniper rifles and APC weapons, and resumed artillery fire after 23:00 “In the Horlivka perimeter militants were active only in the north, in Zaitseve,” added Col. Lysenko. Low intensity combat continues in Avdiivka and the flanks. Militants used mortar launchers and tanks in Avdiivka’s industrial area. Near Donetsk airport, in Opytne, Russia-backed militants were widely using APC and small arms, and sporadically mortars. “Moreover, a single attack from machine guns was registered in Nevelske. In total, 30 hostile attacks took place in Donetsk sector yesterday, and one third of them involved heavy weapons,” summarized the spokesman. 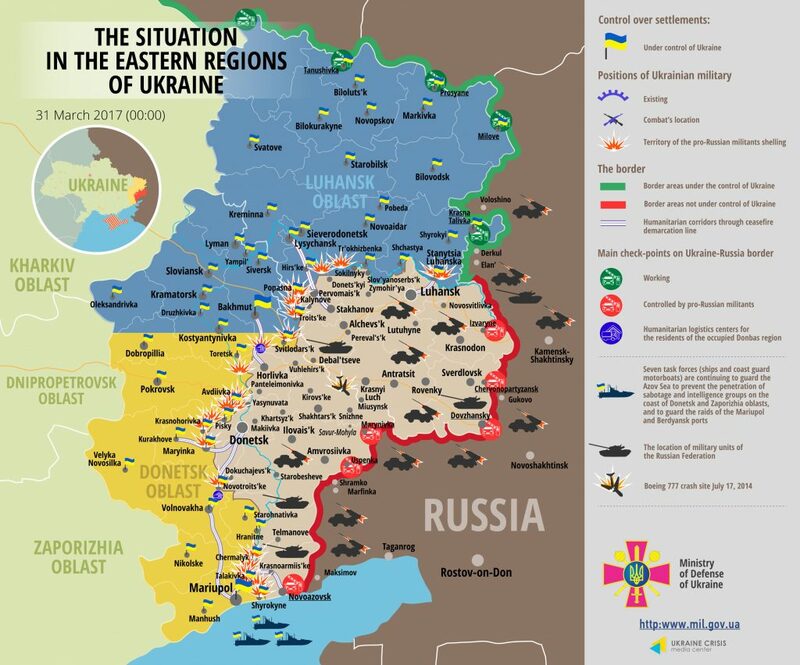 In Luhansk sector, main hostilities took place in Popasna district. Militants conducted a 30-minute mortar attack just after the midnight in Troitske. They were actively shelling Ukrainian front-line positions with grenade launchers later in the day. Massive mortar attack at ATO troops took place there between 16:00 to 18:00 with Russian proxies firing about 100 rounds. “Militants violated the ceasefire twice in Novotoshkivske and Krymske, using various grenade launchers. Militants attacked Ukrainian positions near Stanytsia Luhanska with small arms three times during nighttime,” said Col. Lysenko. In total, militants conducted 13 attacks in Luhansk sector yesterday, having used mortars four times. In Mariupol sector militants’ attacks continue in Mariinka district and in Pavlopil – Shyrokyne front-line area. They sporadically used mortars, heavy armor and small arms there. “Moreover, two sniper attacks were recorded in Novotroitske in the afternoon and after the sunset,” said Col. Lysenko. In total, 26 militants’ attacks took place in Mariupol sector yesterday, six of them involved mortars. Report on the military developments as of March 30 is available here. Interactive data on the shelling: chronology shelling chart and the interactive map.